So last week I was contacted by a spin doctor - a representative from Ketchum, a fancy shmancy PR firm whose client list includes giants like IBM, Ikea, and apparently, Orville Redenbacher. She wanted me to know (and write) about a fantastic new study conducted by a Dr. James Rippe from the Rippe Lifestyle Institute - a place where Big Food meets science as evidenced from their partners page that includes the likes of PepsiCo, Tropicana, Quaker, and ConAgra. So what of this earth shattering study? Well they took 35 whole people and then divided them up into 4 groups. 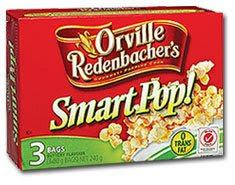 One group had water before an all you could eat lunch, the next 1 cup of Orville Redenbacher Smart Pop! popcorn, the next 6 cups (100 calories) of Orville Redenbacher's Smart Pop! popcorn and the last 150 calories of potato chips. The groups that had water or popcorn before lunch consumed 717 calories between the snack and the lunch while the group that had the 150 calories of chips consumed 803 calories combined. "The new research shows a snack of low-fat popcorn before a meal can help curb hunger without increasing total calorie intake at the subsequent meal"
To me the research shows that people tend to eat around 717 calories for lunch with the popcorn serving as a first course rather than a snack (snacks to me occur hours before the meal). As to why did they eat more with the chips? Probably because chips are highly energy dense. Had they been offered a higher calorie popcorn likely they'd have the same result. Oh, and with each group having an average of 9 people in it, this is a very far cry from a powerful study. So did the spin work? I couldn't find a single news article, so I'd call it a spectacular fail. "Our findings suggest that some snack foods, such as low-fat popcorn, can be a satisfying and effective way to manage calories." 717 calories is an awful lot of calories for lunch so I'd call that a spectacular fail too - if eating popcorn as an appetizer for your meal still leads you to have 717 calories per meal it's certainly not doing much for "managing" calories. Sorry popcorn, you're not magic.